Thousands of students stayed home from school Monday after the Denver teachers union declared a strike. 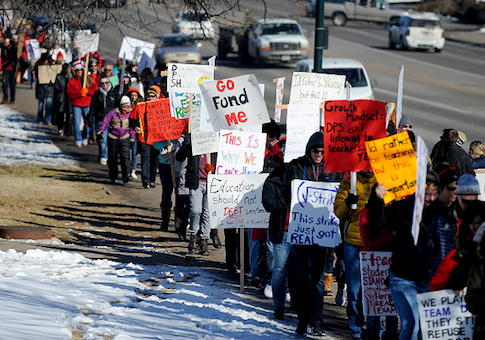 The Denver Classroom Teachers Association, which represents more than 5,500 district employees, declared a strike after the union and school district failed to agree on pay raises. The two sides spent 10 hours in closed-door negotiations on Friday and Saturday before talks failed. The union said in a statement that the district's focus on performance and bonus pay "exacerbate the problems educators are trying to fix." "They doubled down on one-time incentives teachers do not want," union president Henry Roman said in a statement. "DPS is not interested in listening to the concerns and needs of its teachers and special service providers." The district fired back at union criticism, emphasizing that its proposal included significant raises in base pay for teachers in addition to focusing on bonuses. Its proposal would give boost the average salary from $55,000 to $61,000, an increase of more than 10 percent. Superintendent Susana Cordova blamed the union, saying it "did not make any offers that brought us closer together" during the last-minute bargaining sessions. "We are willing to continue working every minute we have available to us to avoid a strike and the disruption it would mean for our students, families, and teachers," she said in a release. "What's most disappointing is that the union walked out on negotiations instead of continuing to work toward an agreement." The Monday strike left the parents of thousands of pre-school children scrambling, as the district announced the closure of all early childhood education programs. Those will remain closed through the duration of the strike. Denver was able to keep the doors to its K-12 classrooms open with administrators and substitute teachers filling in for striking union members. Denver is the second major city to deal with the fallout of public sector labor unrest in 2019. The walkout followed a six-day strike from Los Angeles school teachers in January. The union was able to secure 6 percent raises for its members, as well as caps on classroom size. The walkout had major consequences for taxpayers and parents, with some estimating it cost L.A. $125 million. Talks between the district and the union are scheduled to resume Tuesday. This entry was posted in Issues and tagged Teachers Unions. Bookmark the permalink.